(CIFA): A fourteen thousand kilometre journey, three weeks in the New Zealand and three intense matches in the Oceania Football Confederation President’s Cup have benefitted local Premier League Champions Bodden Town FC on and off the field of play. Bodden Town ended the week long competition with a 1-1-1 record (win, loss, and draw) on the field and countless memories off it. Bodden Town participated in community engagements, visiting the Flanshaw Road School and participating in the UNICEF Let’s Play Fun Day initiative, celebrating Children’s Rights Day. “The team bonding is stronger than ever,” said Bodden Town Head Coach Elbert Mclean. Representing Bodden Town and the Cayman Islands, against teams from Singapore, Fiji and New Zealand was a source of pride for the back to back Premier League Champions. In the opening match Bodden Town were held to a frustrating goalless draw against Singapore. They ran into a well-oiled machine in Auckland City, the eventual champions and lost 9-0. Auckland City are currently in Morocco participating in the FIFA Club World Cup against the likes of Real Madrid and CONCACAF’s top club Cruz Azul of Mexico. In the fifth and sixth playoff Bodden Town produced their best all round performance of the tournament and defeated a physical Fiji Under 20 team 3-0. Strikes from Ricoh Brown, Theron Wood and Jonathan Ebanks hit the target. Additionally Bodden Town custodian Ramon Sealy was rewarded with the Golden Gloves Award as the tournament’s BestGoalkeeper. 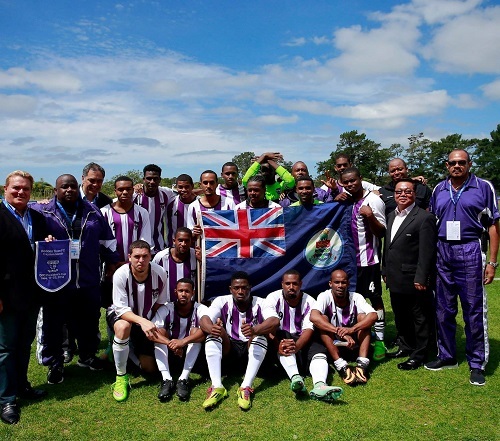 “Bodden Town equipped themselves on and off the field in New Zealand,” said Cayman Islands Football Association Vice President Bruce Blake. “The club gained valuable experience and served as ambassadors for the Cayman Islands with some brave performances. Such international exposure can only raise the team's level of play and in turn raise the standard within the Cayman Premier League. The Football Association is congratulates Bodden Town for a job well done,” he ended. Bodden Town FC were invited by the Oceania Football Confederation and the organisation covered the team’s expenses, allowing them to participate in the inaugural tournament along with clubs from the Oceania and Asia. The tournament is an attempt by the Oceania Football Confederation to strengthen ties with the Asia and Americas.